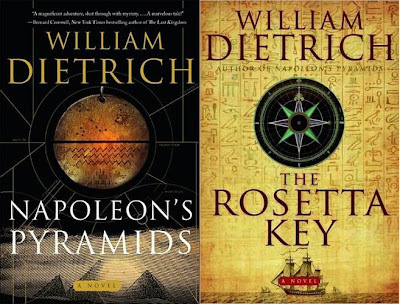 INTRODUCTION: “Napoleon's Pyramids” and “The Rosetta Key” by William Dietrich are two historical thrillers with a touch of the supernatural, the second being the direct follow-up of the first. 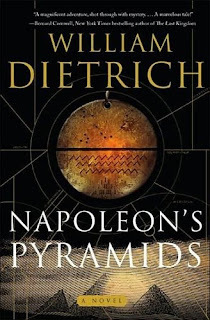 A copy of “Napoleon's Pyramids” got in my hands by chance and I got hooked immediately, so the second volume became a buy on publication book. I will try not to give too many spoilers for “Napoleon's Pyramids” in talking about “The Rosetta Key”, but some will be inevitable so reader beware. SETTING: Both books are set at the end of the 18th century, from 1798 to 1799. France's revolutionary fervor has been spent under the guillotine and now Paris is a city of decadence, excesses, uncertainty and plots. The weak five men ruling Directorate is trying to keep foreign conquests going on so the plunder for them and the mob keeps coming, but also to keep ambitious and popular generals like the Corsican Napoleon Bonaparte from plotting against them. So for plunder, glory and immortality, and encouraged by the Directorate to be as far from France as feasible, Bonaparte is leading an expedition to Egypt and later to the Holy Land. He brings with him an army of savants to decipher the mysteries of Egypt. Our hero, American adventurer and Benjamin Franklin protégée, Ethan Gage, joins the expedition as do some mysterious and unsavory characters like Count Silano, a sinister Cagliostro-like adventurer and reputed sorcerer. Since I am a history buff, I get very annoyed by sloppy research and famous persons portrayed completely out of historically-based character. Therefore, I am happy to say that these books have excellent research with reasonably accurate descriptions of real events and with pitch-perfect characterization for both Napoleon—he is fascinatingly intelligent, charismatic and repulsively megalomaniac—and our alter-ego hero Ethan Gage. CLASSIFICATION/INFO: Both novels are historical thrillers so do not expect deep characterization or deep meaning, but a fun romp that you do not want to put down, and at the end of which you ask for more. Both books are first-person, present tense narratives by Ethan Gage with occasional recollections—especially in “The Rosetta Key” to give backstory for the events that occurred in “Napoleon's Pyramids”. They stand at around 350-400 pages each. To get a satisfactory ending you should read both since “Napoleon's Pyramids” ends on a literal “balloon-hanger” with almost nothing resolved. 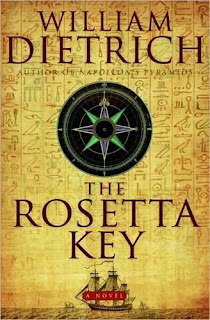 “The Rosetta Key” though ends quite satisfactorily, wrapping up almost everything of interest but leaving scope for more. And I want more!!! PLOT HINTS AND COMMENTS: In 1798 Ethan Gage—an early thirties American, adventurer, gambler, mason and former employee and protégée of Ben Franklin—is living by his wits and luck at the card table in the decadent Paris of the Directorate age, just after the end of the Terror and before the age of Napoleon when uncertainty and corruption ruled the day. One day his luck turns—though it is unclear if it was for good or bad—when he wins a strange Egyptian medallion at a card game. Immediately a mysterious Count Silano offers him a nice price to buy it, but Gage does not like the count so he refuses, and then he is attacked in the street, framed for murder and thrown in jail. However he receives an offer of pardon if he joins a mysterious expedition under the leadership of the current darling of the French people, the Corsican general Bonaparte, who is journeying to a mysterious destination at both his and the Directorate rulers behest. For the Directorate, the goal is glory, plunder and ridding France of a popular general who could be dangerous. Bonaparte takes lots of scientists, mathematicians, journalists, artists with him, and the destination is of course Egypt. Ethan is to be the expedition expert on that new hot thing that Franklin, now sadly dead, started taming—electricity—while we learn later that Napoleon has ulterior motives. Ethan joins the gang with his friend, the journalist Talma, and strange things start to happen on the way to Toulon where they embark, with the famous English spy and adventurer Sidney Smith, recently escaped from a French prison, saving Ethan's life from an ambush. Ethan participates at some of the most memorable events of the campaign: the capture of Malta; the two battles of Abukir; the battle of Cairo; he gets in, out, in, out of Bonaparte's favor; he meets Nelson; he visits the Pyramids; finds love with a beautiful mysterious woman; finds treacherous and cruel enemies; and makes and loses friends. The medallion, so badly wanted by various parties, may lead to books of ancient wisdom which would give their owners amazing powers. Gage is determined to find and destroy, or even better . . . hide those books, while the other parties look for them for their own purposes. There are also some brilliant cameos, especially by the famous “black” general Dumas, the son of a French aristocrat and a black slave who was a leading general of the revolution before being eclipsed by Napoleon and then was the commander of the French cavalry in Egypt before parting ways with Bonaparte and dying in obscurity several years later. Of course his main claim to fame is that after he returned from Egypt he became the father of Alexandre Dumas. In a clear homage to Dumas, the author has the main villain Count Silano having a Cagliostro scene with General Dumas, in which Silano challenges the general to a strange duel involving eating a pig—called Cagliostro's duel after the mysterious charlatan/sorcerer that figures so prominently in many Dumas novels. After Bonaparte forbids a classical duel with guns or swords and the general declines, storming from the room, Count Silano exclaims: “he was wise to refuse, this way he will get back to France and have a son who will become very famous”. “The Rosetta Key” takes off pretty much where the first book leaves, though it starts dramatically with Ethan Gage awaiting execution as a spy, with roughly 4000 Ottoman soldiers captured by Napoleon at Jaffa and executed en masse in one of those rare Napoleonic moments of outright cruelty though done with some political purpose in mind. In this case to frighten the Ottoman soldiers and rulers of Syria to surrender to Napoleon who, with about 15k soldiers, wanted to emulate Alexander and conquer all lands all the way to India since the English navy is blocking the way to France. Of course it does not work, but that's only because the Syrians have a ruler they fear more than Napoleon—Djezzar The Butcher. Ethan recounts the story of how he got there starting from his journey on the British ship he landed on at the end of the first book where he cleaned the sailors at cards—which later led to his current fate—to Jerusalem where he met another interesting girl, and to his capture by the French. His lover Astiza is still missing. The mysterious books are still wanted by everybody and Silano is still the odds on favorite to get them unless Gage finds them first. Then after Gage escapes the mass execution, the story moves forward to the siege of Acre, where Djezzar, helped by the British and some French noblemen, fights Napoleon, and then to various places in the Holy Land, then Egypt, and it ends on a quite satisfying note in Paris. In many ways this is a better book, more polished than the first one, the main historical characters are still memorable. For instance, when Napoleon arrives before Acre, Djezzar, a very feared 75 years old, climbs the wall and yells at the French, “I killed more men and bedded more women than Napoleon and I will ### him too”. The only weak moments that irritated me after a while were the repetition of Napoleon ordering Ethan's execution for some reason or another, Ethan escaping, and then coming back to Bonaparte for some reason or another.